낙안성 남문의 가운데로 뻗어 있는 큰 길에 접해있는 첫번째 초가집이다. 담장을 쌓지 않고 비워둠으로써 대문의 역할을 하고 있는 대문간을 들어서면 바로 왼쪽에 '田'자 모양의 집이 자리잡고 있다. 낙안성 안의 유일한 '田'자형 집인데, 땅이 좁아서 택한 평면이라 여겨진다. 방 2개, 점포, 부엌으로 구성이 된 이 집은 대문간의 첫칸이 방이고 다음칸이 부엌이다. 방의 뒷쪽으로는 점포로 사용되던 마루방이 있고 그 옆에 안방이 있다. 방의 앞쪽으로는 각각 툇마루를 달아 개방하였다. 벽은 흙벽인데 부엌의 옆 벽면은 돌로 쌓았다. 벽의 윗부분에 물건을 올려놓을 수 있도록 긴 판자를 매어놓아 작은집에서 쓸모있는 공간을 마련하였다. 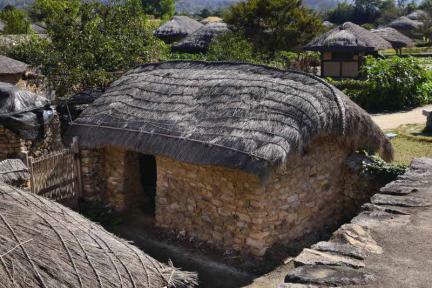 This is the first thatched house among the houses located along the wide road leading to the south gate of Naganseong Fortress. The open space between the walls is the gate of the house. 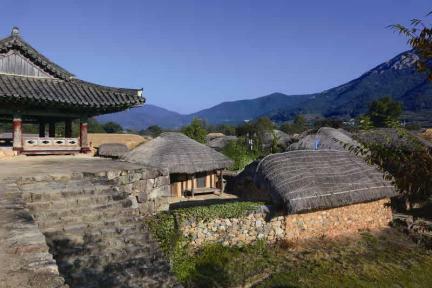 Entering the gate, one sees the house built in the “田”-shaped layout on the left as the only 田-shaped house in Naganseong Fortress. The shape seems to have been chosen because of the narrow land. The house consists of two rooms, a hall, and a kitchen. The first partition from the gate is a room, and the second is the kitchen. At the back of the room is marubang (wood-floored room), which used to be a store. 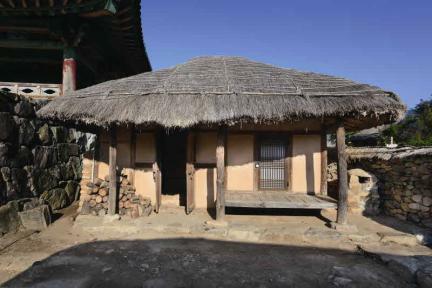 Next to the marubang is the anbang (main room). The front side of each room is equipped with toenmaru (wood-floored veranda). The wall of the building is made of earth except the kitchen’s side walls, which are made of stones. To use the small house more effectively, a shelf hangs on the upper side of the walls to place things. ※ Viewing of the cultural property above is usually available anytime but may be limited depending on the owner’s personal circumstances.